An island where weary skyfarers come to rest. Even tender promises can become unyielding shackles. Golonzo Island is the location for chapters 25-28 and 119 of the main quest. 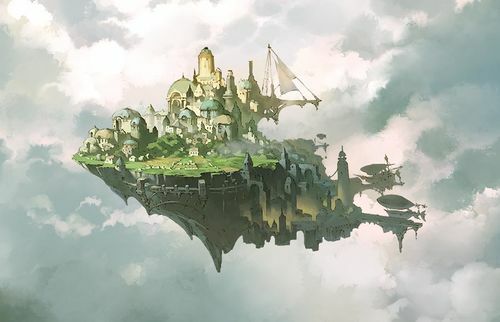 An island of top-class craftsmen who possess skills in independently repairing any airship in Phantagrande Skydom. Although simple fixes for airships can be performed anywhere, Golonzo is the only place trusted by skyfarers for large repairs and upgrades. The central dock and its rising mast not only serve as the island's emblem, but also provide daily encouragement to craftsmen as it can be seen from anywhere on the island. This massive dock is the symbol of Galonzo. Inside, countless ships wait for workers to perform repairs and maintenance. New ships are also built here, and research into how to create faster, stronger, more beautiful ships is constantly underway, day and night. An airship undergoing adjustments in the central dock. To a crew, airships aren't just a means of transport; they're its spirit and livelihood. As a result, there's a great deal of trust involved between skyfarers and the skilled workers who handle their ships. The cranes jutting across the skyline are essential to airship construction and maintenance. Each crane is named according to its size and lifting capacity, with the largest being called Midgard-class. A small building that monitors port traffic. Ships are always coming and going for repairs, often in a state of confusion due to the frequently imprecise air traffic instructions. A residential area lined with houses. Knights gather at the pub come nightfall. This is a two part quest. The second part is a special quest with only the Main Character and support summons are disabled. Location: Chapter 25: Golonzo Island - Faber Precinct Start QuestNetwork Errors will appear if the hosting conditions are not met. 8,000 Wind damage 4 times to random allies. 5,000 Wind damage 8 times to random allies. 2,000 Wind damage 10? times to random allies. Duration: ∞ on all allies. 18,000 Wind damage to all allies. number unknown on all allies. 1 hit? Repel does 150k+ damage. Warning! Does not work for Plain Damage! trigger, works the same as Medusa HL. Bring at least 1 Peridot Carbuncle and Athena (Summon) or 2+ Peridot Carbuncle. the 75% and 25% triggers to let dispel users know you're done. Delay is very strong here as Morrigna has no Overdrive to break and only 1 Charge Diamond by default. Sage should bring 2 Dispel and 1 Clear. Other sources of dispel such as Robomi Rocket also work well, remember that you can combo call to dispel again. Morrigna builds resistance to debuffs rapidly. Save your stronger debuffs for the later parts of the fight. The stronger your 6 parties are the earlier you can start debuffing. Gravity and Fear from 50%. / PetrifiedStops enemy's charge diamonds from filling. Warning! Does not work for Plain Damage! and dispel one at a time. 50% to 25%: Start using PetrifiedStops enemy's charge diamonds from filling.
. Time to ramp up your dps.
. Make sure you have Phalanx for every Charge Attack, or at minimum a Peridot Carbuncle. A district still rich in greenery. The tree-lined pathways bring back faint, nostalgic memories. The island's defining feature is this enormous ship dock. It's always puffing out white smoke, day and night. Raids:I Wanna Be a Skyfarer! Get Ready to Golem Rumble! This is a two part quest where you can only use the Main Character. The first part allows you to use your grid and choose support summons, whereas the second part forces you into a Wind element Mechanic class without the use of your grid or support summons. An area encompassing the central dock's launching bay. Workers watch over the departure of new ships. Location: Chapter 28: Golonzo Island - Departure Area, Central Docks Start QuestNetwork Errors will appear if the hosting conditions are not met. Inflicts a permanent random debuff on all allies. Gains a random 60 second buff. 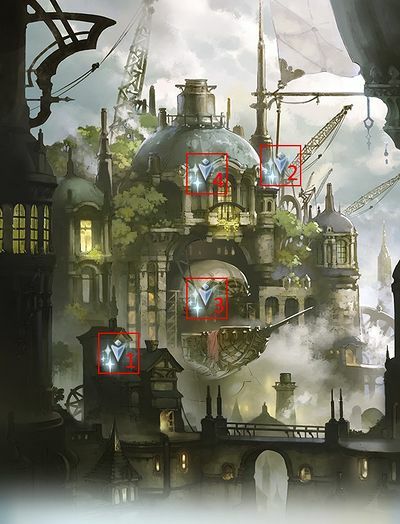 Damage increases with the amount of attack buffs on both allies and Mithra have, the debuffs on the party, as well as removing/guarding debuffs from party. Heals self to full HP. Can't be cast more than once. Return will be cast on the first turn after Mithra releases its True Power. This means you have one turn to kill Mithra after getting it below 50%. Return can only be cast once, but all other triggers that you cleared will occur again. "Veil" is an unofficial name used by the wiki for this status effect. Its actual in-game name is "Immune." to guard against the debuffs, or you can clear them with Clarity or any other clear skill. This generally isn't recommended unless absolutely necessary as it will increase Defrag's power. New players may find Mithra challenging until they get a decent grid. The main idea behind killing Mithra is to get it as close to 51% as possible so you have two turns to kill it; because of this players with weaker weapon grids can find Mithra to be quite challenging. This does not mean that all hope is lost if Return is cast: after Return is cast all triggers besides Return are reset. This means the player can just continue the fight dealing by continually hitting Defrag's triggers. Mithra's main form of damage is Defrag. To prevent Defrag's power from increasing it is recommended to never let Mithra's charge attack go off. It's a good idea to bring some mitigation or healing if you don't have enough HP to tank all the hits. This page was last modified on 25 January 2019, at 18:34.